North and Central Coast Plovers – Success in Three Places! Not only did Nehalem Bay have the first western snowy plover chick in over 50 years hatch and fledge this year, so did our newest park! Sitka Sedge State Natural Area, which will be open to the public in 2018, had three chicks hatch in late May. Just recently, two of these little birds have been spotted 100 miles from their birthplace! Plover biologists banded the babies in order to keep track of them. In late July, teenage plovers were seen sporting these very bands on beaches near Florence. Now that they are big birds, they have spread their wings to explore the coast. These birds will likely return to their birthplace to breed next year, if they can make it through the winter. The birds have color bands on their legs – white and green on left and violet on the right. If you spy them please report it on eBird, or if you don’t have an eBird account you can contact OPRD directly. Photo by E. Kygsman, INR. Plovers occasionally nest outside of plover management areas (plovers don’t read our maps, apparently). 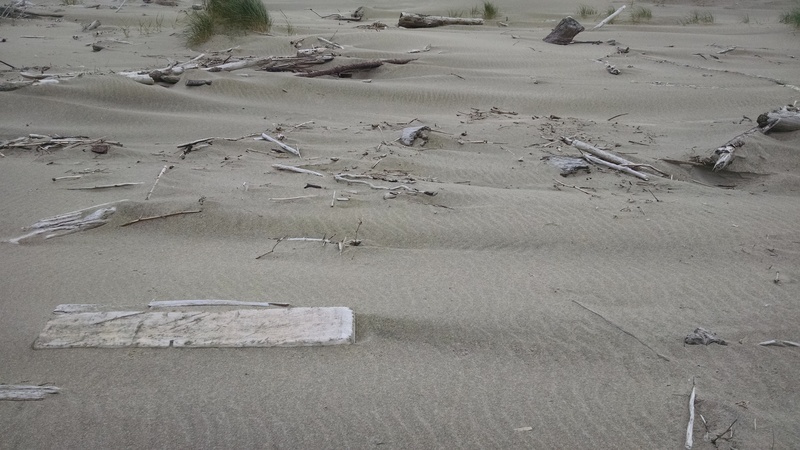 After reports of nesting plovers near Bayshore, Oregon State Parks beach rangers have been protecting each nest (with signs and ropes) as it is found. These buffers around the nests help people avoid stepping on the inconspicuous eggs and chicks. Two of the nests at Driftwood have now hatched, and tiny chicks are out on the beach! Reports of these birds are now showing up on e-Bird. If you get the birding bug and want to go look for them, please be aware that the tiny chicks can be easily stepped on, and it’s very hard for them to escape. Give them some space while you enjoy this new experience! Snowy plover dad and chick at Driftwood. Hiking the Coast? Protect what you find! Western snowy plovers need you. The Pacific Coast Trail has been covered in snow this year, and many hikers have chosen the Oregon Coast Trail (OCT) as an alternative. Who can blame them? The Oregon coast is gorgeous! 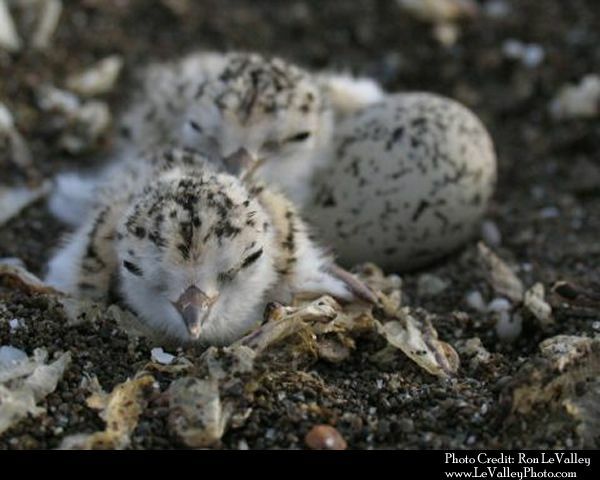 This puts more hikers on Oregon beaches, where a small, fragile shorebird known as the western snowy plover is nesting. The birds are listed as threatened under the Endangered Species Act, and there are only about 750 birds on Oregon’s beaches. Late last month, OCT hikers crushed a nest that was within a few days of hatching. This unfortunate event serves as a reminder for all OCT hikers and beach visitors to be vigilant on sandy beaches during the spring and summer. Snowy plovers can be found on any sandy beach, and especially in the designated plover management areas. We encourage you to #sharethebeach in these areas, where we are working to improve sandy beach habitat and reduce disturbance from predators, people, and pets. Plover management areas are marked with signs letting you know that the dry sand is restricted to all recreation. This includes camping, firewood collection, and potty breaks! Three types of signs that mark western snowy plover management areas. If you see these, please stay on the wet sand! Watch for signs. You’ll know you’re on a plover beach when you see yellow “shorebirds nesting” signs, like those pictured above. Hike on the wet sand. Plovers build their nests in dry, open sand in tiny, shallow scrapes that are very well camouflaged. They’re very easy to miss (or step on). A bird will run from its nest when disturbed by activities it considers a threat—activities we may see as harmless. When this happens too many times, the eggs get cold and are exposed to predators and the harsh winds, killing the chicks in the shells. Some activities are restricted or prohibited. Camping, kites, campfires, and vehicles (including non-motorized ones like bikes) are not allowed in plover management areas. Please plan your route accordingly. Dogs are not allowed in occupied areas. Even on a leash. Even on the wet sand adjacent to signed or fenced areas. Check the maps. Our OCT maps have been updated to include plover-specific information at state parks with nesting plovers: Bandon, Nehalem and Sitka Sedge near Sand Lake. The South Coast map covers Waldport to Port Orford. Please let us know any edits to these maps or other information that would make planning your trip easier. By following these tips you’ll be doing your part to help these tiny birds make it on the harsh Oregon coast – and avoid tainting your trip with a horrible memory of crushed eggs and chicks! Last week a historic event occurred at Nehalem Bay State Park. The first plover chick in over 30 years hatched on our beach! 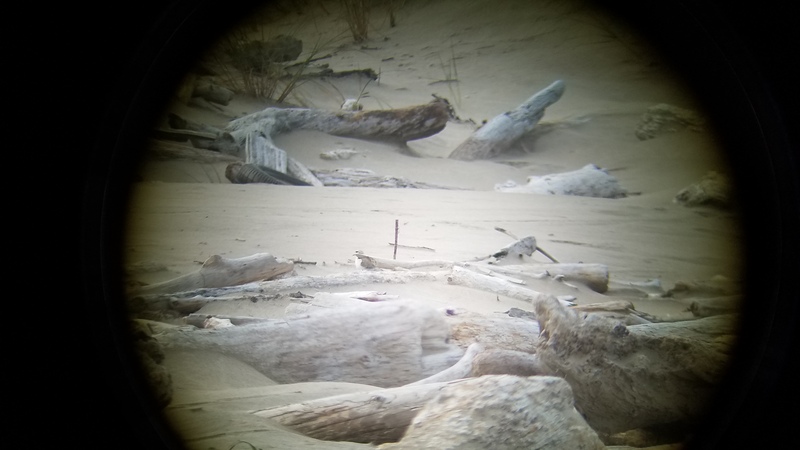 This is the third year snowy plovers have tried nesting at Nehalem since recovery efforts began at this site in 2012, and all previous nesting attempts failed. I had thought this nest – a two-egg scrape tended by two adults – was also lost last Thursday, when I found it empty and unkempt, with nothing but the tiniest shell fragment in the bowl. Worse, I found a dead chick a few feet from the nest with no indications of how it got there. After I had packed up all my gear, I resumed searching for any signs of plovers. That’s when I found the funny tracks – two sets, adjacent, and with the distinct pattern of plovers. They were slightly different sizes, and I dared to hope that maybe one chicks survived. These seemed to be different sizes. I was suspicious. And hopeful. Friday morning I went back out to the beach just to see what I could find, and boy, I am glad I did! A lone male was sitting oddly on the sand. Literally on the sand – his belly was just barely touching the ground rather than fully pressed into the sand like a plover that is loafing (that’s a bird-specific scientific term for “relaxing”). He didn’t appear alarmed, either. As a biologist, all his behavior struck me as “hinky”. I set up my spotting scope at the high tide line about 75 feet away, far enough that he wasn’t making any movements that indicated he was upset that I was there. Brooding male western snowy plover. He is just left of that upright stick in the center of the photo. The longer I watched through the round lens of the scope the more suspicious I became. Then a crow flew overhead! The male ran, and out from under him tumbled the tiniest little fluff ball. The chick hunkered down and froze, blending into the sand immediately. I watched through the screen on my phone as I held it precariously against the spotting scope lens. This was some real “Wild America” playing out before my eyes. The dad perched on a piece of driftwood, watching as the crow flew off. He bobbed his head, made a little chirp noise, and his chick came running and snuggled under his feathers. Now it was just a puffy daddy plover with two little chick legs sticking out from his breast. Well, awesome! What now, wildlife biologist? Trampling by beach visitors that don’t know it is there, by exuberant dogs gallivanting through the sand, by horses, even by deer and elk. Predation from crows, coyotes, and gulls – any disturbance that makes the chick exposed to these predators could spell the end! Weather – the chick needs to stay with dad to keep it at the right temperature. He shades his chick when too hot, and cuddles it under his feathers when too cold. Abide by recreation restrictions in the designated plover areas . This means no dogs. Your pup may mean no harm but could easily squish a hiding chick. It also means no bicycles, kite-like objects, or other vehicles. These frighten the dad and his chick and can separate them. Watch for chicks on the beach, and if you see any snowy plovers (in or out of the designated areas) give them a wide berth. Watch your step! Plover chicks freeze and rely on camouflage to hide from danger. They also like to hide in small depressions, like footprints, so forging your own path in the sand instead of staying in tracks left before you is better to avoid trampling chicks. If you spot any snowy plovers, report them via e-Bird or e-mail me at vanessa.blackstone@oregon.gov with the location, date, number of plovers, any bands if you see them, and either a photo or the key marks that tell you they were western snowy plovers. Starting today Oregonians share 16 beaches with this small shorebird for the spring and summer. The only shorebird that nests in the dunes of the Oregon Coast (apart from the wayward killdeer), western snowy plovers are a threatened bird that is making a come-back thanks to all the efforts of conservation groups, state and federal agencies, and most importantly, Oregonians. Recreation restrictions at beaches managed for shorebirds go into effect today; watch for the yellow diamond signs to show you are entering a plover area. 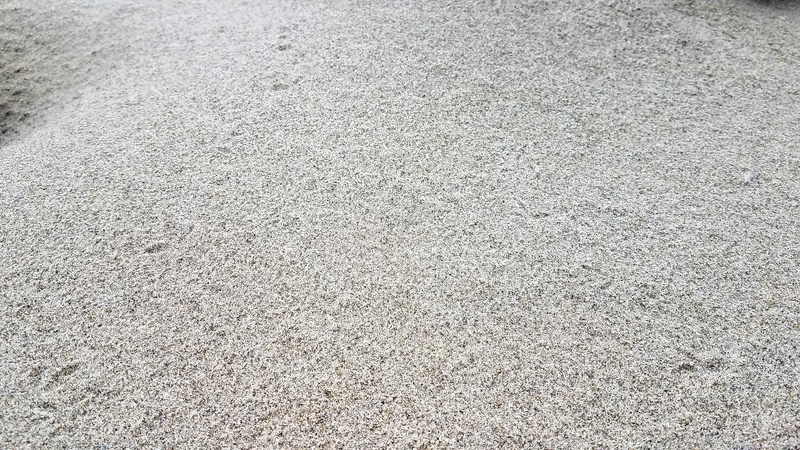 The birds make little nest scrapes in dry sand, and from here through July there could be camouflage eggs out there. For more on recreation restrictions, visit the official OPRD regulations page here. If you want to know more about these amazing birds, join Oregon Parks and Recreation Department’s wildlife biologist Vanessa Blackstone for an in-depth workshop on the western snowy plover. Members of Coastwatch, SOLVE, and folks that just like walking the beach can all learn what to look to aid this tiny shorebird when out on our wild Oregon Coast. The first half of the workshop is all about the bird! The second half focuses on how to survey for plovers, and is required for OPRD’s Plover Patrol volunteers. 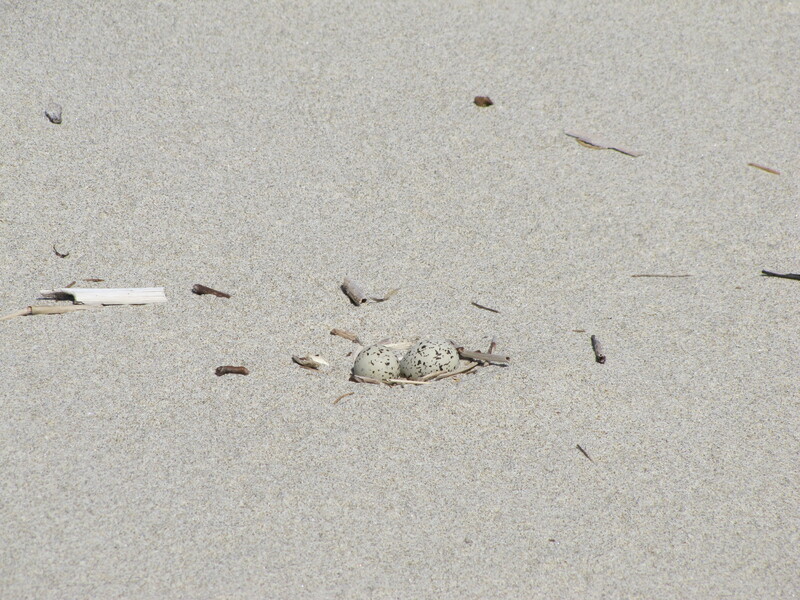 Two western snowy plover eggs. Note there is no vegetation around them – plovers need open sand, and do not nest up in the beach grass. Do you spend a lot of time on the beach and want to know more about western snowy plovers? Join Oregon Parks and Recreation Department’s wildlife biologist Vanessa Blackstone for an in-depth workshop on the western snowy plover. Members of Coastwatch, SOLVE, and folks that just like walking the beach can all learn what to look to aid this tiny shorebird when out on our wild Oregon Coast. The first half of the workshop is all about the bird! The second half (after lunch) focuses on how to survey for plovers, and is required for OPRD’s Plover Patrol volunteers. Noon: Lunch break! Get to know your fellow plover lovers. Light refreshments provided. “Mock” survey to practice! Prizes for those that get it right! Local residents at Sand Lake have been hearing about Sitka Sedge State Natural Area, the newest addition to OPRD’s parks focused on conserving amazing natural spaces for Oregonians to enjoy. Apparently western snowy plovers heard about it too, and they have set up some home sites! This is the first documented nesting activity at Sitka Sedge since 1984 – a similar story to Nehalem Spit at Nehalem Bay State Park where last April plovers were found nesting there for the first time since 1984. I’m sure there is an interesting theory about that. Either way, they disappeared from our two north coast beaches the same year, and now they have returned one after the other! Another interesting story is that BOTH pairs of plovers where discovered by volunteers on our Plover Patrol! 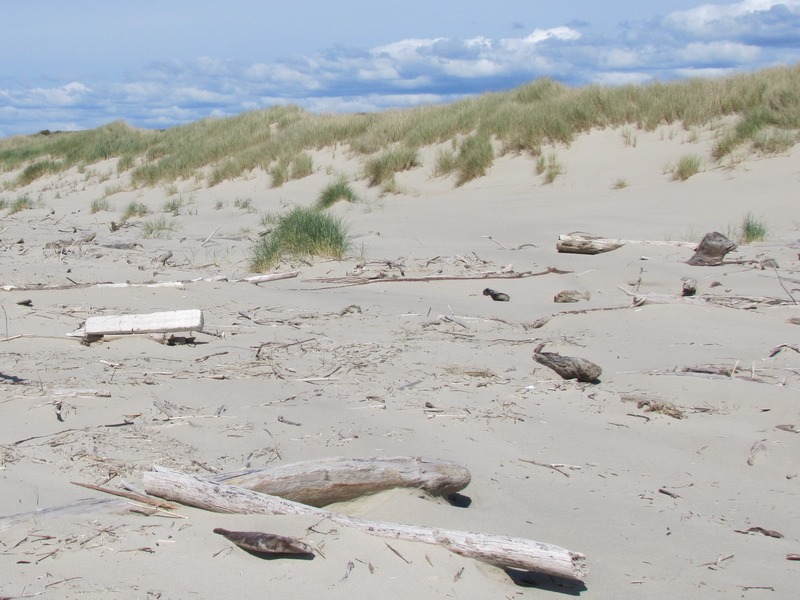 The beach at Sitka Sedge is one of 17 designated for western snowy plover recovery, and now that birds are in residence a Shorebird Conservation Area is in place. To help this these birds gain a foothold, vehicles (motorized and non-motorized, including bicycles), dogs, and kites are prohibited in the SCA from March 15-September 15. All other recreation must remain in the wet sand. These restrictions give the birds the best chance at raising a family – plovers are very sensitive to disturbance, and need that extra bit of space between us and their nests! You can help be a part of threatened species recovery by sharing the beach and letting plovers nest in peace. Would you like to be on the team that spots these birds as they reclaim their historic nesting grounds? Oregon Parks and Recreation (OPRD) is looking for volunteers to survey for western snowy plover, a threatened shorebird, at four of our State Parks in 2016! We are very excited that this threatened shorebird is making a comeback, and we need help to track where they are interested in nesting. Last year a pair nested at Nehalem Bay for the first time in 30 years. To help plovers make this comeback, OPRD has four beaches set aside for them where we ask the public to let them nest in peace. But! We need to know if the plovers are there! Male Western Snowy Plover patrols Nehalem beach while his mate sat on their nest. Time commitment is at least 1 survey per month, and each survey usually takes 2-3 hours. Training is provided on survey protocol and identification. Surveys consist of walking on the beach on a (relatively) nice day, scanning for signs of plovers! Not too shabby. 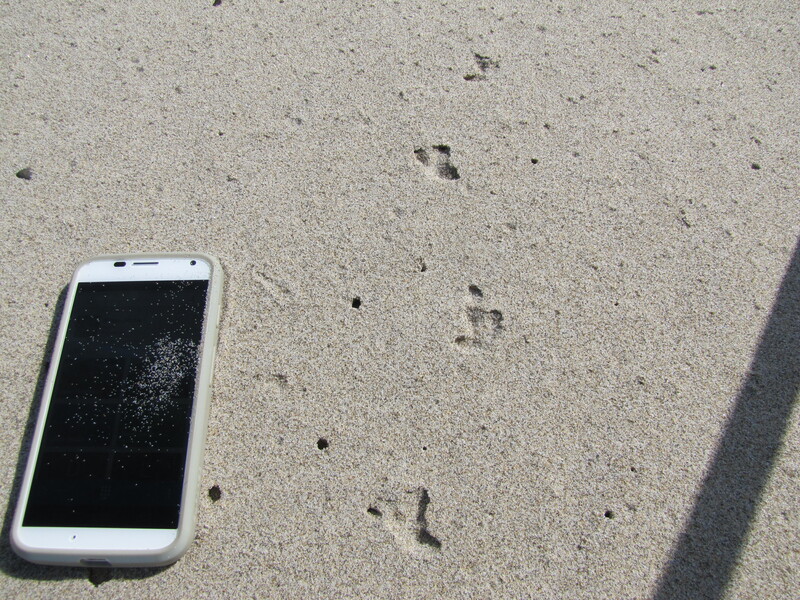 Surveys involve walking the beach and scanning for signs of western snowy plover, documenting potential predators and food sources, and noting recreation uses. Volunteers should be comfortable walking a few miles on the beach in wind and sun or light drizzle. In addition, a 4-hour training is required so that you can be listed as a sub-permittee on OPRD’s Recovery Permit. Don’t worry if that’s confusing – it will be explained during the training. If you would like to attend a training, even if you don’t want to be a volunteer, please participate in our Doodle Poll: http://doodle.com/poll/a42fhzhsuykuqh5c. This helps us select the date(s) that work for the most people. To apply to volunteer, contact vanessa.blackstone@oregon.gov. 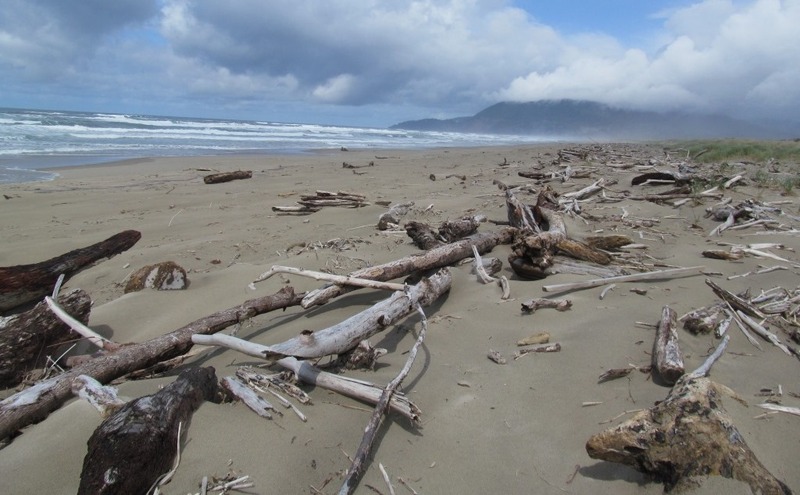 Beach recreation restrictions on the spit south of Nehalem Bay State Park are being lifted for the remainder of the year. 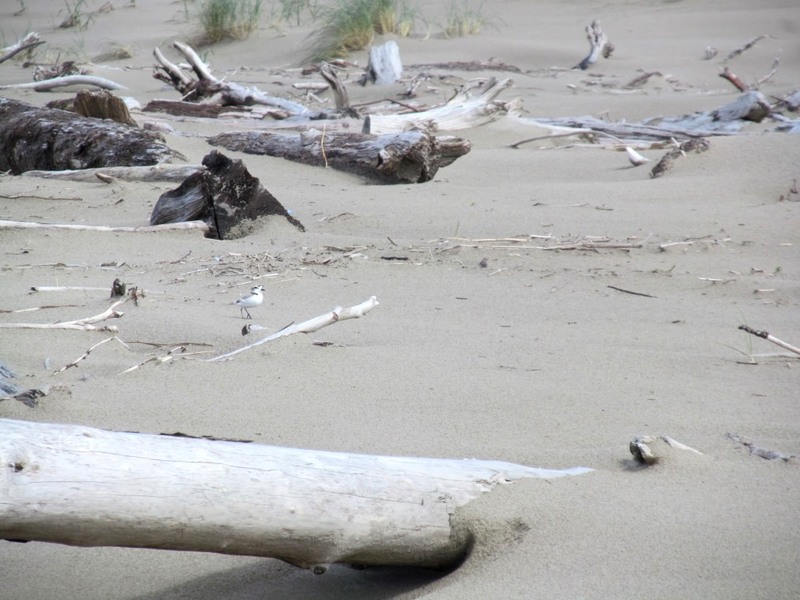 The restrictions went into place this April after a pair of western snowy plovers were found nesting on the spit and were scheduled until September 15, when the breeding period ends. Lifting the restrictions means beachgoers may recreate in the dry sand, along with their leashed dogs. Vehicle use remains restricted, including bicycles. The park will continue presenting interpretive programs about shorebirds through the summer. We have been surveying for the birds since first spotting them on the spit this past March, and at this point it is unlikely a pair would start a new nest. There just isn’t time for the parents to incubate eggs and raise young before winter. Even though their nest attempt wasn’t successful, it shows that we are on the right track for shorebird recovery at Nehalem. I would like to thank all our visitors for their compliance and understanding over the past few months. Restrictions will go back in place March 15, 2016, and OPRD will resume surveys for nesting shorebirds. Click here for more information on the HCP (Habitat Conservation Plan) and beach restrictions, and plover recovery. It’s been a long, busy summer, and I’ve been out on the Spit many times since discovering our little plovers’ nest. Back on April 9th, I was out with USFWS biologist William Ritchie to “float” the eggs – floating is exactly that. You put the eggs in a jar of room temperature water and see where they float. Based on where they are in the water (bottom = freshly laid, surface = close to hatching), biologists can estimate how old the eggs are and when they will hatch! It isn’t the most precise effort, but it did give us an idea of when to expect the eggs might release the little balls of fluff that are plover chicks. It also isn’t the easiest thing to do. The adults are not happy about people being close to them, and run away to safety. And you can’t just walk up to a nest, since crows and ravens (corvids) are smart and curious enough to follow a direct trail… or just watch you if they happen to be around. AND you can’t actually SEE the nest because it is so camouflaged, so there is some trial and error in approaching it! We use similar techniques that the corvids use, and follow plover tracks. Western snowy plover tracks in the sand. MotoX phone for scale. So, Will and I carefully checked around to make sure no corvids were hanging out, then carefully crept roundabout to the general area of the nest, then even more carefully floated the eggs. No pictures of that, we wanted to get the work done and get out as quickly as possible. It was a nice day and not too cold, but every moment the parents are away from the nest increases the chances of failure. Will determined the eggs were likely to hatch the last week of April, and then we carefully packed up equipment and snuck away, using a small broom to brush our tracks out of the sand to leave less evidence for curious corvids. I had my date, and set the calendar! As the weeks went by, ODFW and I took turns checking on the nest, usually seeing the female only through spotting scopes to avoid disturbing her. Our beach rangers let the public know what all the signs were for, and beach visitors were (mostly) respectful of these birds’ privacy, for which I am very thankful. 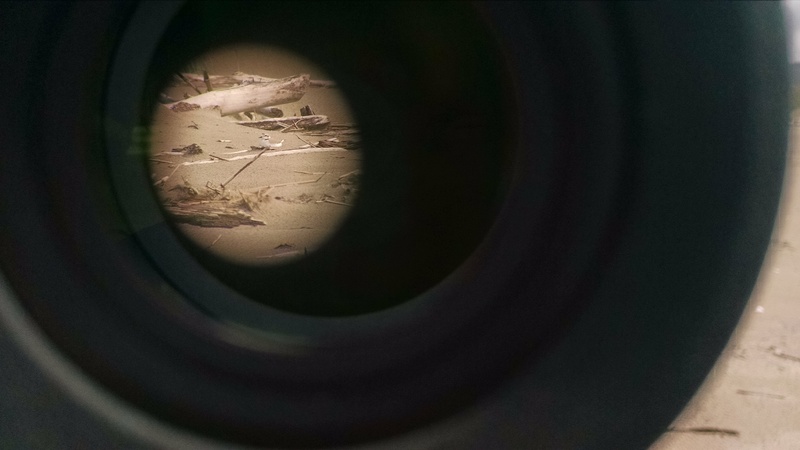 What I saw on most nest checks – through the lens of a spotting scope. Then I got the email from ODFW. Their Friday nest check had the female off the nest, foraging, and the male wasn’t sitting in her place. That is unusual. Winds were high, though, and ODFW didn’t linger on the beach. All weekend I worried over our little plovers, wondering if A/W/A:V and his unbanded female had lost their nest. I went out on the following Monday to check the nest – to confirm or deny that it was still there. What had been a relatively flat sandy spot was now an uphill slope, with no sign of eggs or nest (or my wildlife camera). To say I was sad is an understatement, but at the same time this is what happens out on our Oregon Coast. It is a rough, rugged place, and early nests are often lost to the weather. Since my wildlife camera vanished as well we don’t know exactly what happened to the nest. Did some people walk by on a windy day, bumping the female off the nest, and by the time she came back the sand had blown over her eggs? Was it a crow, or the resident beach coyotes? Was it simply such a windy gust that no matter how tight she sat she couldn’t keep the sand off her precious eggs? I don’t know, and never will (unless that camera washes up somewhere). Taken April 9, the nest was in between the long, flat-topped board on the left and the tuft of beach grass. Taken April 23, at a slightly different angle. That same long flat board is in the bottom and the beach grass is at the top. We continued to survey the Spit for any sign of plovers; they usually nest again after losing a nest, and will keep trying until it gets too late in the breeding period. After late July there just isn’t enough time for the birds to incubate, hatch, and raise their young to fledging before winter. I found some tracks shortly after the nest was lost, but then even those too disappeared. And the beach continued to change. The southern half of the spit that had been such nice habitat early in the season kept getting more sloped as the winds sculpted the sand around driftwood. The northern half started getting more ideal, with flat expanses and bits of shell. Even though this nest attempt failed, it shows us that Nehalem is indeed attractive to western snowy plover and the HCP plans were not in vain. OPRD and USFWS have opted to lift recreation restrictions for the remainder of the breeding period, since there have been no sign of plovers all throughout May and June. As for me, I’m planning some habitat restoration to get that beach a little wider, to give the birds a bit more room away from the wind, the predators, and the people. Maybe next year A/W/A:V will come back and try again. Or maybe one of his cousins. Either way, I’ll be waiting with a spotting scope to help them as best I can. Those were my words at 1:30 pm Friday, April 3. I was out on the beach at Nehalem Spit, looking for western snowy plovers. And boy, I found them! See, March 15 – July 15 is the “detection period” for our north coast Shorebird Conservation Areas, and our dedicated Plover Patrol volunteers go out bimonthly to scan the beach for this tiny dune ghost of a shorebird. 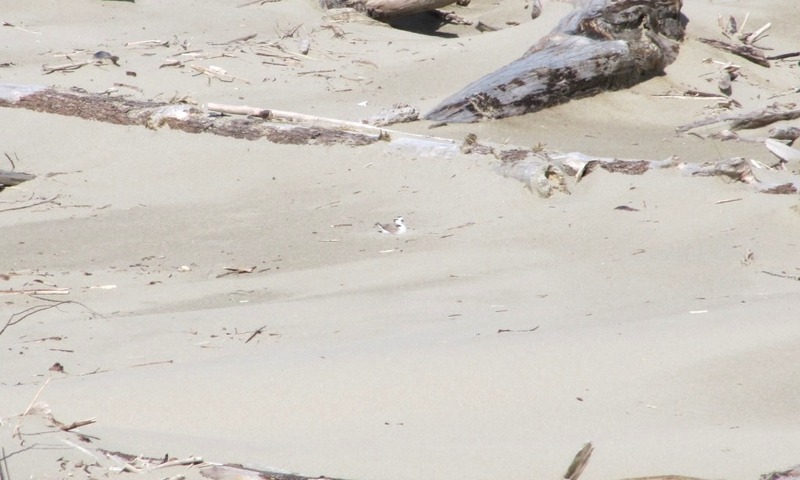 On March 26 our Patrol spied 3 snowy plovers, all banded: male A/W/A:V, female O/G:V, and O/Y:V. The V stands for the violet leg band on the right leg, and indicates these birds were hatched on the southern Oregon coast last year. These same birds had been spotted by birders loafing on the spit throughout the winter (check eBird!). But when I got the message that fateful Thursday I was excited! These birds were still on the spit, and the breeding period was at hand! Cut scene to Friday April 3! I was on site meeting with Dan Elbert of USFWS and Herman Biederbeck of ODFW to strategize monitoring the birds, with intentions to head out and check on the birds. We didn’t really expect to find nesting; the earliest snowy plovers have nested in Oregon was April 17, and that was over two weeks away. The weather did not cooperate though – it was raining. It is so harsh out there for plovers that looking for them in the rain isn’t good for them, even if you can spot them hunkered down, hiding from the inclement weather. My wildlife biologist compatriots left the park, and I stayed around to discuss events with park staff. And then… the weather cleared! Sunny and beautiful and the perfect time to go out on the beach! I didn’t really expect to find nesting – or even plovers! I honestly figured they would move on, head back down south, and that we wouldn’t get them to stay without some habitat restoration efforts first. The last time I was out on the Spit driftwood lay so think that you could scarcely put your foot down on dry sand. Near the jetty it was how I remembered – driftwood packed tight like sardines in a tin. But the further north I went the more it opened up, and the beach was lovely. Dry, flat sand with bits of detritus scattered about, some logs to hide behind, and the occasional shell for camouflage. Maybe plovers were still here. I paused to take some photos – because you never know when you’ll need a good photo of the beach – and a small white thing ran and then halted at the edge of my vision. I switched to my binoculars. Plover. She bobbed up and down. My heart rate increased. She ran a bit further and bobbed again. That is a sign the bird is uncomfortable! Uncomfortable means nesty! OMG!! I backpedaled away from the plover and bee-lined for the wet sand, spotting scope whacking my shoulder and bins bouncing! At this distance the plover was just a little white speck, easily missed a midst the driftwood and crab shells. She scurried across the sand and sat funny. A tiny little plover, sitting in the sand. She picked up a little piece of something or other and put it down again. The plover version of knitting? She stood up, turned around, poofed out her belly feathers like a dancer spreading her skirts and nestled back down again. It’s been over 30 years since plovers nested at Nehalem Spit. Welcome back, little birds! Make your nests, sit tight on those eggs, and raise some little cotton ball babies! I’m honored to be the first to see it, and hope that many more to come will see the dune ghosts dart across the beach.